Press Start with Hannah from the Moo Crew! COME JOIN HANNAH OF THE MOO CREW ON TUESDAY, APRIL 30th FROM 7-9 PM AT PRESS START ARCADE & BAR! GAMING IT UP AND PLAYING THE BEST IN CLASSIC COUNTRY EVERY OTHER TUESDAY AT 1413 SOUTH VIRGINIA STREET IN MIDTOWN RENO. PRESS START IS 21 AND OVER WITH THE BEST SELECTION OF CLASSIC NOSTALGIC VIDEO GAMES OF THE EIGHTIES AND NINETIES. THEIR PINBALL MACHINES SPAN OVER MANY ERAS! THIRSTY AFTER AN AIR HOCKEY GAME? RELAX IN THEIR LOUNGE AS YOU GRAB A BEER OR A SIGNATURE COCKTAIL FROM THEIR FULL BAR. 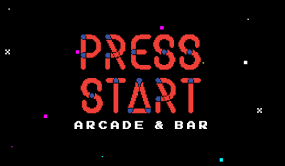 PRESS START BAR & ARCADE IS ALSO THE PERFECT SPOT TO BOOK YOUR NEXT GATHERING!